The COT report explains the reason we saw such a dramatic drop in the gold price ( along with all of the other safe havens such as bonds and the Yen) today once the payrolls number hit the wires. We did see some small reduction of the overall net long position of the hedge funds through Tuesday but for the most part, they stood pat – until today! That huge net long position, the highest since November 2012 back when gold was trading near $1700, was extremely vulnerable to the least possibility of a reversal in the sentiment towards interest rate hikes by the Fed. At the risk of beating a dead horse, I have noted time and time again here that gold is an asset that throws off no yield and pays no dividend. Thus it must compete against those asset classes that do. 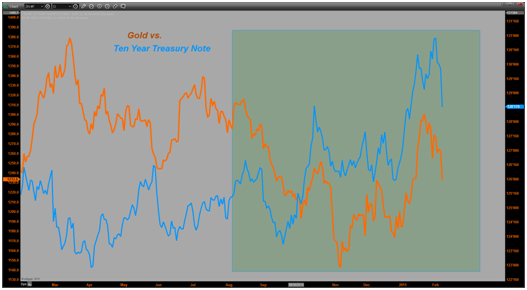 While the yield on the Ten Year Treasury had been moving lower, gold was moving inversely and working higher. Today’s strong payrolls number, but especially the huge upward revisions to November and December readings, caused a shift reversal in thinking that had come to dominate the markets- namely, that the recent spate of data coming out of the US suggested the economy was not yet ready to bear higher rates. That sentiment had forced money into Treasuries pushing yields lower and removing some of the direct competition for gold. The payrolls number has now caused a rethinking of that view with traders now anticipating an interest rate hike is back on the table as soon as June this year, if not sooner, instead of the September or later view that had dominated the market for the last few weeks. You might remember that last month’s payroll number was pretty good ( even prior to the revisions today) but traders chose to focus instead on the wages component, which had shown a decrease for the month of December. That report, a month ago, was followed by a sharp move up in gold as traders first began to really dial back interest rate hike expectations on account of the lack of upward pressure on wages. Today’s report however showed that category moving up and when coupled with the strong number for this month, plus those previously mentioned upward revisions to Nov. and Dec. that was all she wrote for that old sentiment. The thinking has now shifted, and will remain that way until proven otherwise, that the US economy is on a growth track of sufficient speed to allow the Fed to go ahead and make their first hike this summer. Look at it this way, try to spot the trend in the payrolls numbers and not focus so much on any one month. Let’s take the last three months that we have the data for; November, December and January 2015 and sum those totals and take the average. We get 339.67K. Looked at from this angle, one can clearly see that the trend is one of increasing job growth. Throw in an upward movement in the wages component and you can see why the Fed is going to be monitoring next month’s numbers extremely closely. Do not forget, every single FOMC member, including the doves, all view the lower crude oil and energy prices as inflationary or pro-growth over the medium to longer term. They are also agreed that the SHORT TERM impact is deflationary. Thus they are going to be looking past the current low energy prices for any signs of growth of a rate fast enough that might preclude them from getting out front of any potential build in inflationary pressures. They do not want to get behind the curve. My way of interpreting this is what the consensus of the market seems to have become today – one more strong month of job growth, especially upward pressure on wages, and we are going to get our first hike. That is going to make things very rough for gold moving forward. It will still garner some support over the current turmoil in Europe, and perhaps over the occasional geopolitical uncertainty that crops up from time to time, but if, and this is a big “IF”, the jobs picture shows further consistency moving forward, gold is going to be in for a great deal of overhead resistance. One last chart to illustrate why I believe this to be so. I have posted this chart before to show how since last summer, gold began to move in almost perfect sync with the Ten Year Treasury note futures. ( remember a rising note means falling yields). 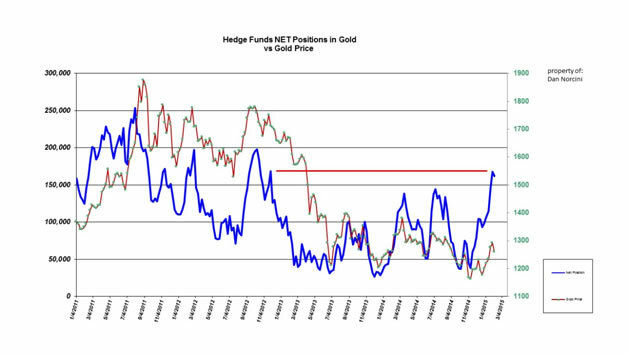 The chart tells the story – as long as traders are bidding up bonds or notes and pushing interest rates lower, gold gets a bid and tends to do well. As soon as the bonds or notes begin moving lower ( yields rise), gold moves lower. Note also that it has nothing to do with any cockamamie manipulation theory by evil bullion banks. It has everything to do with interest rate expectations and investor’s views towards gold/precious metals asset class. If investors look ahead and see a period of falling or ultra low/negative interest rates here in the US, they are going to view gold favorably. If the opposite is true and they expect the end of the near zero interest rate environment to be finally upon us, they are not going to want to tie up capital in an asset that just sits there with little hope of appreciating. Everything depends on sentiment. That is why yesterday’s arguments often have little bearing on today’s market moves. Sentiment, at times, can change or swing faster than a weather vane. Trying to understand what is the mind of the market, or sentiment, at any given moment, is therefore the key to understanding the “WHY’ behind moves.